Demna Gvasalia has become one of the most influential forces in fashion, as whatever he sends down the runway at Balenciaga and Vetements quickly ends up in Topshop and Zara—and then in many of our wardrobes. One of the biggest concepts he is spearheading for spring is even more divisive than last year's kitten heel pointed mules: It involves splicing separate garments together to make strange new hybrids. At Balenciaga, he created a trench coat which is merged with a denim jacket to give a distorted shoulder line that makes you feel a little dizzy to look at—we can expect this coat to be worn by the most directional street stylers come February. He also created three-in-one trousers with a pair of cropped cigarette trousers with patchworks of three pieces of contrasting checked fabric. Well, what's better than one pair of new pants than three? Demna isn't the only one to get rather experimental with his pattern cutting this year: At Sacai, we saw heavily deconstructed checked skirts, and Alexander Wang merged a silk camisole with a grey jumper. You might think this is a trend that will never take off, but we expect there will be some extreme patch-working in Zara any week now, and many buyers have told us they'll be investing in this look for the coming season. Keep scrolling to see the trend that will confuse parents everywhere. 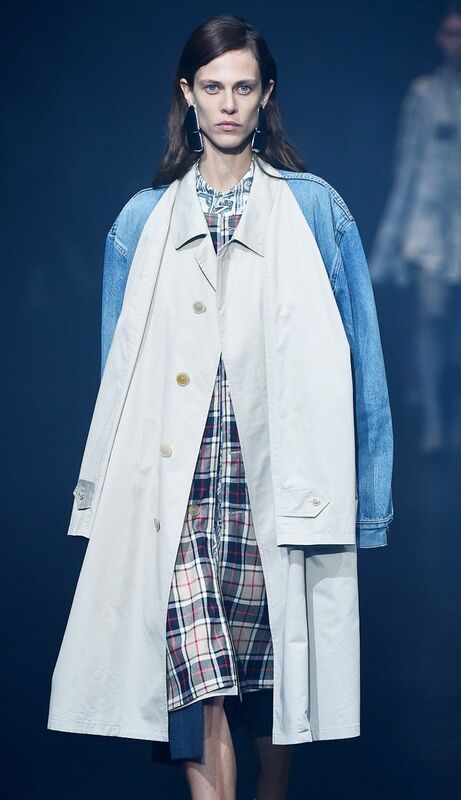 Style Notes: Balenciaga's denim jacket–and–trench coat mashup is getting a lot of attention from fashion buyers. Style Notes: Sacai is a brand known for its deconstruction, and this skirt is a real medley, but somehow it works. Style Notes: These Balenciaga trousers are bound to inspire a thousand high-street copies. Style Notes: Alexander Wang's jumper-meets-camisole is confusing, but we imagine a Hadid or Jenner will wear it come spring. Next up, see the trends that are set to be big for S/S 18.